Now available in twelve more statement-making shades, NYX Professional's velvety smooth Soft Matte Lip Cream delivers a burst of creamy color and sets to a stunning matte finish. Designed to be worn with the NYX Suede Matte Lip Liner, each lightweight hue is surprisingly durable and delightfully creamy. Enriched with skin smoothing silicones, these lippies keep your pout looking and feeling soft with a creamy whipped texture. It’s no wonder this sweetly scented formula is a fan favorite. About the brand:: NYX Professional Makeup is a leading US Based makeup brand loved globally by all beauty lovers and professional makeup artists. NYX Professional Makeup offers an exceptional quality of professional makeup & beauty products in super stylish and modern packaging.The Brand has a variety of cosmetics ranging from Their highly pigmented and striking lipsticks and glosses, eye-catching eyeshadows, eye and lip liners, high coverage base makeup foundation, concealers and primers for all skin types along with stunning eye palettes, eyeshadows and makeup brushes to choose from. Explore the entire range of Lipstick available on Nykaa. 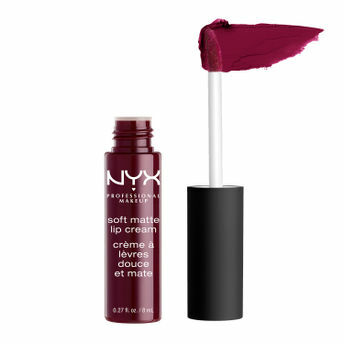 Shop more NYX Professional Makeup products here.You can browse through the complete world of NYX Professional Makeup Lipstick .Alternatively, you can also find many more products from the NYX Professional Makeup Soft Matte Lip Cream range.